On January 17th, Elijah’s director, Rabbi Alon Goshen-Gottstein was awarded the “Figure of Reconciliation” award, by the Polish Council of Christians and Jews. The award is given annually to a figure who has contributed significantly to advancement of interfaith relations globally. The award was given in view of Rabbi Goshen-Gottstein’s contribution through Elijah and in particular for his contribution to several events involving Christians and Jews in Poland, over the past years. The award was presented in the presence of several hundred priests, seminarians, and leaders of the Jewish and Christians communities of Poland, who were present in Tarnow for the annual day of Judaism celebration. The context of the award ceremony, a concert of Jewish music, provided the backdrop for the acceptance speech. “We must go beyond tolerance and respect. In the same way that we can be inspired by one another’s music, we must also be inspired by the spiritual life of one another. If I had to chose one word to sum up my message today”, said Rabbi Goshen-Gottstein, “it would be ‘inspiration’. We must ask, how can we inspire one another. In what way can your example as a Christian inspire me to be a better Jew and vice versa”. 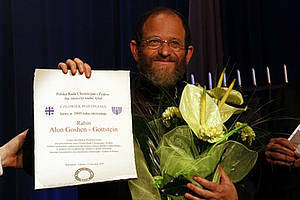 As a conclusion to the award ceremony, Rabbi Alon Goshen-Gottstein led the crowd in singing to the words of the Song of Songs 2,14: “Let me see your form, Let me hear your voice; For your voice is sweet, And your form is lovely.” Read horizontally, rather than vertically in an allegorical fashion, this can refer to our obligation to see and hear the other as the other is, to appreciate his or her beauty, to hear their unique voice. Understanding, listening and appreciation of beauty are thus integral to the formation of relationships, and thus also to relations between faiths. For a video of the acceptance speech, in English and Polish, CLICK HERE. 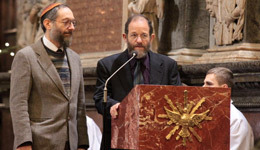 The Catholic Episcopal Conferences of several European countries have instituted a day of Judaism, where the Church reflects on its relationship with Judaism and affirms its bonds with Judaism and Judaism’s continued significance, for itself as well as for the Church. In both Italy and Poland, the day of Judaism is celebrated on January 17th, as an introduction to the week of Christian unity. The Pope’s recent visit to the Rome synagogue took place on the day of Judaism. In Poland, day of Judaism celebrations are hosted every year by another city. 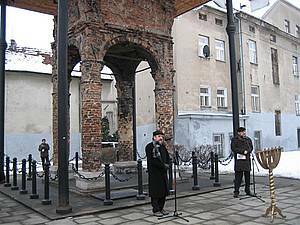 This year, the city of Tarnow, in southern Poland, hosted the day of commemoration. The event included several memorial visits and prayers, led by Chief Rabbi Michael Schudrich and attended by leading members of the Jewish community and local Catholic dignitaries. The key event took place in the Tarnow Cathedral, where a liturgy of the word was held. The key text was Genesis 12, and Rabbi Alon Goshen-Gottstein was the keynote speaker, offering a homily on “lech lecha”. A summary of the homily follows in the Sharing Wisdom section (below). At the conclusion of the day of Judaism ceremoney, Rabbi Alon Goshen-Gottstein led the crowd in singing “Lord grant us peace” in Polish. For a (slightly wobbly) video of the song in Polish, CLICK HERE. I have been asked to comment on the two words in Genesis 12, 1: Lech lecha, go forth, or go to yourself. There are several levels that come to mind, as we think of what it might mean to practice “lech lecha” in the framework of the relations of Christians and Jews. I would like to explore four different levels of what “lech lecha” might mean. 2. Upon deeper examination, we realize that identity is not constructed by defining ourselves against the other, but by deeper entry into ourselves. Discovery of who we are is accordingly an inward journey, a discovery of self. The hassidic communities that used to live in these environs, around Tarnow, would have been very familiar with the hassidic interpretation according to which “lech lecha” signifies: go into yourself, into your very self. 3. Entry into the self opens up still further dimensions of relations with the other. 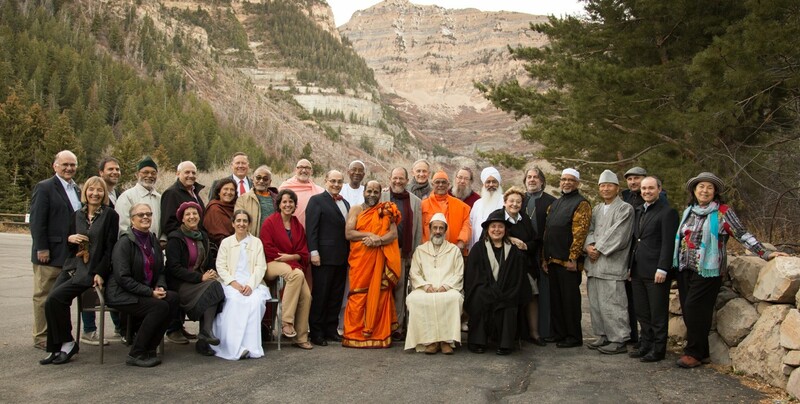 While the superficial self is self-involved and oppositional, the spiritual self recognizes a deeper unity with others. In the deepest sense, there is no separateness. The Image of God provides a foundation for our common humanity. We are all part of one greater whole. If we seek to understand ourselves, we realize that the self is interconnected, a part of a larger whole. In terms of Jewish-Christian relations, this means that there is also a profound interconnectedness. While Christianity obviously affirms more readily its relationship to Judaism, this interconnectedness is also significant for Judaism and its message to the world, expressed through Christianity. So now, “lech lecha” is a command to discover yourself in the other, in a movement of rediscovery and reintegration. This is the mandate of our times, hence the great surge in interfaith work. In this way, all those who are working to deepen relations with the other are seeking their own deepest self in relation to the other. 4. “Lech Lecha” means literally to go. There is a specific dimension of going, and in our case – going towards the other. Today this takes on special meaning, when a figure of one religion goes to the house of worship of the other. Today is the day when the Bishop of Rome goes to the synagogue. And on a much smaller scale, I too have the privilege, as a Jewish speaker, to come to you and to share these thoughts. “Lech Lecha” thus means going to the other in order to to listen, share and learn. 5. Being in Tarnow one realizes a whole other dimension of what going and leaving mean in relation to the other. Tarnow is a symbol for the state of Jews in Poland. They are present by their absence. The other has gone. He is no more. There is only the memory, but no person, no reality. No Jew lives in Tarnow today. No synagogue is left standing, only the bimah is left of what was once a glorious synagogue. How do you go to the other who has himself gone? This is a special challenge of the Polish situation. In one way, one has to recapture that presence through memory. Go to what you remember and bring it back to life. This is what the day of Judaism seeks to achieve. In another way, we are called to find new ways of engaging “lech lecha”. Israelis are coming to Poland, rediscovering their old self and in some cases also the self of the Poles. Polish people, in turn, are called to visit the Holy Land not only as the land of the Bible, but also as a place where they may encounter the living people of Israel. In conclusion, “Lech lecha” creates a circularity. Go and come back, go outwards and return inwards. We are all called to this movement of reaching out and returning within, discovering of self in other. I conclude with the prayer that the day of Judaism provide an ongoing vehicle for such discovery, for reowning memory and self, and that through it means and inspirations will be found to deepen mutual knowledge and self knowledge.